The RGV FC Toros' Francisco Pungo, left, battles the Houston Dynamo's Eric Bird during their exhibition game at H-E-B Park on Saturday Feb.3,2018, in Edinburg. EDINBURG — Driving into the facility at H-E-B Park every day this week, Houston Dynamo players George Malki and Charlie Ward always heard jokes from their teammates. Malki, Ward, Eric Bird and Memo Rodriguez are among of group of Dynamo players who got their start in the organization playing for the RGV FC Toros, and large banners of all four players still hang outside H-E-B Park, clearly visible to anyone driving into the main entrance. The Dynamo certainly made the pitch look like their house on Saturday, cruising past the Toros 9-1 in a preseason exhibition. Ward played the first 60 minutes of Saturday’s match, taking part in the first two of three 30-minute periods. He departed RGV FC as the club’s all-time leader in minutes played at the time of his signing with the Dynamo last season. First-year Toros coach Gerson Echeverry said Saturday was a learning experience for a squad that has been through just four days of training. The Toros rotated 32 players. With the most proven and consistent group on the pitch during the first period, RGV FC trailed just 1-0. Then, the floodgates opened, as the Toros were unable to match up with a Dynamo squad that reached the Western Conference finals last season. Houston opened the scoring in the 27th minute of the first period, when Andrew Wenger found Arturo Alvarez in plenty of space on the right half of the penalty box, allowing Alvarez to put a left-footed shot into the left side of the net. During the second period, former Toro Justin Bilyeu scored a header off a corner kick in the 3rd minute, Mac Steeves netted a shot from the top of the box in the 10th minute, and former RGV FC standout Bird scored on a first-touch shot from about 20 yards away in the 25th minute. Steeves was Houston’s second-round pick at No. 43 overall in the MLS Superdraft on Jan. 19. The Dynamo continued to pour it on during the third period. Alberth Elis put home a header when the ball deflected to him off a corner kick in the 10th minute, Mauro Manotas scored a header off a corner in the 17th minute, and RGV FC alum Memo Rodriguez scored an easy tap-in from point-blank range during the 18th minute. Manotas added a second goal in the 21st minute to make the margin 8-0. RGV found its first goal of the match in the 22nd minute, as Elo Ozumba charged down the right wing and about halfway through the penalty box before sending a low, right-footed shot just inside the left post. Dynamo capped the scoring on a Toros own goal in the 27th minute. RGV FC did not produce an official roster for the match and played without jersey numbers. The club has announced just 10 signings with the open of the USL season not until March 16. The Dynamo season begins March 3. 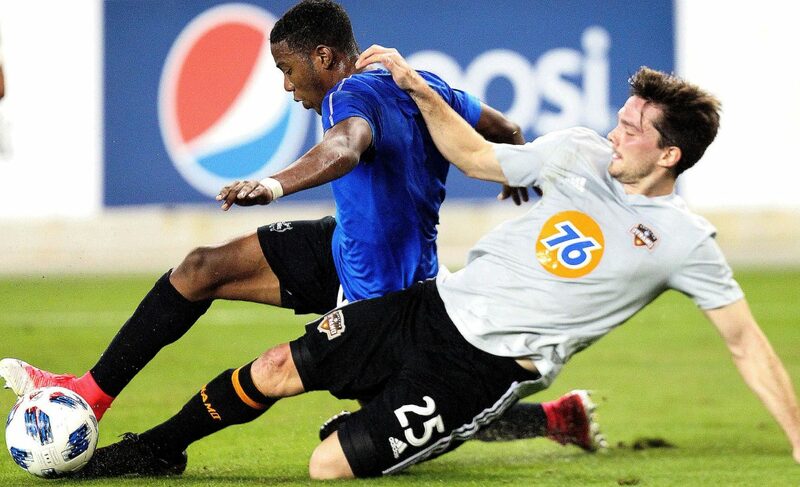 Houston Dynamo President of Business Operations Chris Canetti said the organization would be open to returning the Valley in the future, possibly for a match in the Lamar Hunt U.S. Open Cup. An MLS regular season game is less feasible, Canetti said, because of obligations to sponsors and season ticket holders and the competitive disadvantage that comes with forcing the Dynamo to travel for a home game.